1 of 3 Heat oven to 400 degrees F. Cut baguette into 1-inch pieces. Spread onto a baking sheet and spritz with nonstick cooking spray. Bake at 400 degrees F for 10 minutes, until lightly toasted. Remove from oven and let cool. 2 of 3 In small bowl, whisk together white wine vinegar, Dijon or spicy brown mustard, sugar, salt and pepper. While whisking, add olive oil in a thin stream. 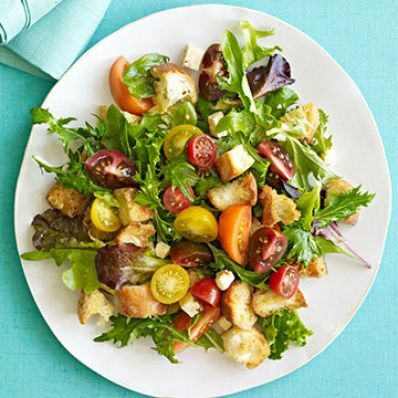 3 of 3 In large bowl, toss together bread cubes, mixed baby greens, tomato-basil cheddar and mixed heirloom tomatoes. Drizzle with dressing and toss to combine. Let sit 5 minutes to soften; serve. Per Serving: 475 mg sodium, 2 g fiber, 5 g sat. fat, 20 mg chol., 15 g Fat, total, 30 g carb., 10 g pro., 287 kcal cal.